Police stand in front of the courthouse as protesters call for J20 charges to be dropped. “They came here on inauguration day expecting to be able to express their free speech right, and instead, they were kettled, their civil rights were violated, and now, they are facing years, some even decades, in prison. Stand with them today, and going forward, until this fight is won,” Olivia, from the Dead City Legal Posse. 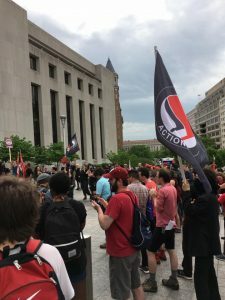 On May Day 2017, a long day of marches and rallies culminated with a protest at the D.C. Superior Courthouse calling for all charges to be dropped against Trump inauguration protesters. After a protest on January 20, 2017 (J20) 214 people, all of which were arrested en masse, were initially charged with felony rioting, which carries up to a decade in prison. Last week, prosecutors brought even more felony charges, including inciting or urging to riot, conspiracy to riot. Additionally, three new individuals, at least one of which was not present at the protest, were charged with felonies, as well. “They have been slammed with ridiculous, bogus charges, all in the name of suppressing dissent and discouraging protest in the United States. Similar repression happened at Standing Rock and in Minneapolis, and since Inauguration Day, it’s here in our city,” Olivia, who helped organize the protest, told the crowd. Olivia, Dead Legal City Posse, addresses a rally calling for charges to be dropped against J20 protesters. These charges have serious ramifications for the right to assemble and the criminalization of dissent. 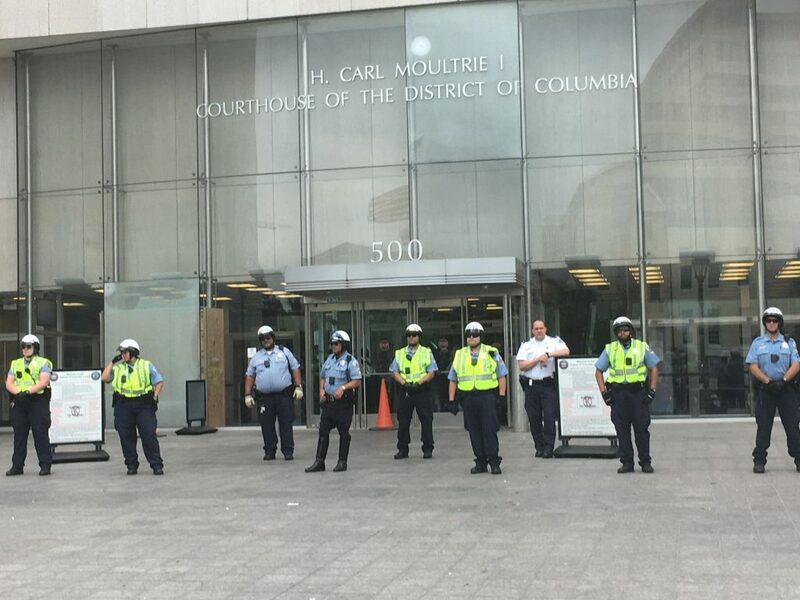 While some property damage did take place and several police officers were reportedly injured, DC prosecutors seek to hold everyone liable who was present at a First Amendment protected assembly for the actions of a few individuals. Prosecutors have cited such actions as merely being present at a march or chanting as evidence. This runs flatly in the face of First Amendment jurisprudence, international human rights principles, and US criminal procedure. These charges are meant to intimidate and silence activists broadly. 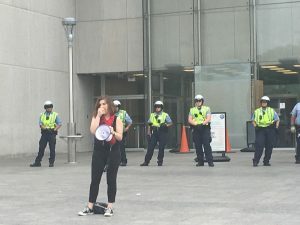 Protesters at the courthouse drew attention to the fact that these charges threatened the right to free speech broadly, while calling on all charges to be dropped. “It’s really important that we show our support for everyone who is affected by these arrests and charges, whether it’s coming out and protesting, raising awareness on social media, or telling the news media how police repression impacts our communities,” Olivia explained. On J20, as protests against Trump took place across the country, over 200 activists, along with legal observers, and journalists were mass arrested by police. Mass arrests have not been used by the Metropolitan Police Department (MPD) since the early 2000s, when police repression of global justice and anti-war protests resulted in several successful lawsuits and a number of news laws aimed it at reining in the police. This is an extremely disturbing line of development. One does not lose their First Amendment rights just, because other individuals in the same assembly possibly break the law. Nor is chanting at a protest a “conspiracy.” Yet, 214 people face up to a decade in prison and a $25,000 based on exactly this type of reasoning. In an attempt to find evidence to sustain these charges, MPD not only seized the cellphones of the individuals arrested, but raided the home of an activist, Dylan Petrohilos, who was not even present at the protest. Petrohilos explained to the Washington Post how on April 3, 2016 police broke down his front door, seized computers, and an anti-fascist flag.The warrant for this raid revealed that an undercover police officer had infiltrated planning meetings for the protests. On April 28, 2017 Petrohilos was charged with a number of felonies. It was at this time that prosecutors also brought additional charges against those arrested during J20. The serious nature of the charges and the sheer number of those charged, too many to even fit into a courtroom for a single arraignment, mean that legal proceedings will go on for quite some time. Trials will most likely not start until March 2018, as defense attorneys need that much time to review the 650 hours of video evidence gleaned from seized cellphones, police body-worn-cameras, and helicopters. This solidarity against repression is particularly important. The charges are designed to not only chill speech, but demoralize those arrested. Prosecutors instead of backing off, have doubled down. And the D.C. city government seems disinterested in holding the police accountable. Peter Newsham, who was interim police chief at the time of the arrests, was confirmed as police chief, in spite of calls from civil liberties groups that he not be confirmed absent an investigation of what transpired on J20. Police must be held accountable when they violate people’s rights. The mass arrests and mass felony charges of J20 protesters represents a broad attack on the right to dissent. Such attacks must be opposed.